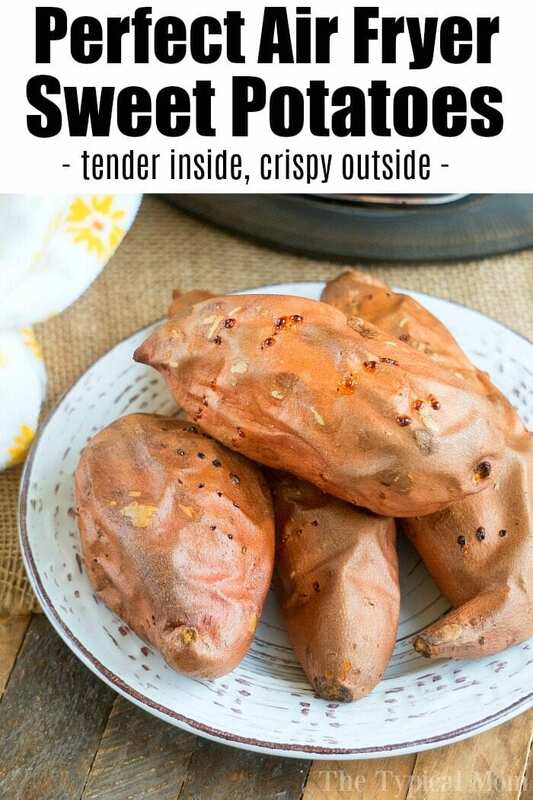 Fluffy sweet potato in the air fryer recipe is here! Sweet potatoes are the best side dish for the holidays or year round. Crispy outside but tender inside. I think this vegetable is totally overlooked. 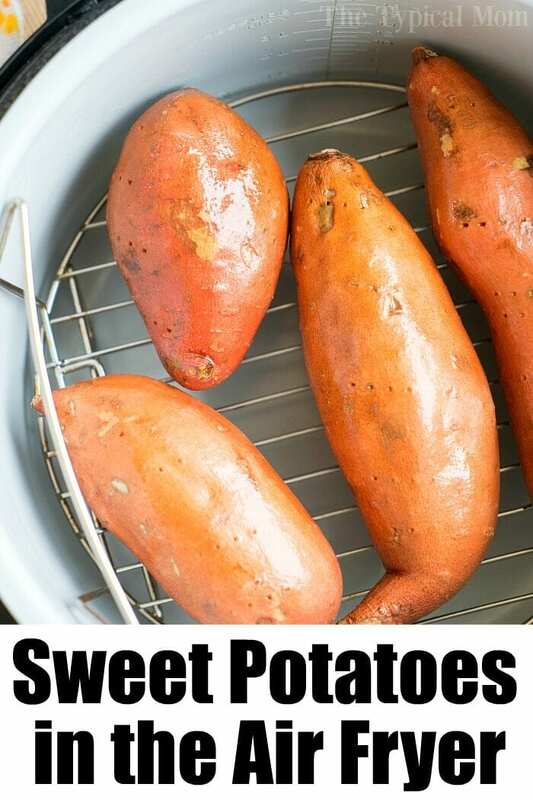 Sweet potatoes are naturally sweet, a yummy side dish, and healthy too! It’s one of our favorite Ninja Foodi air fryer recipes you’ve gotta’ try. 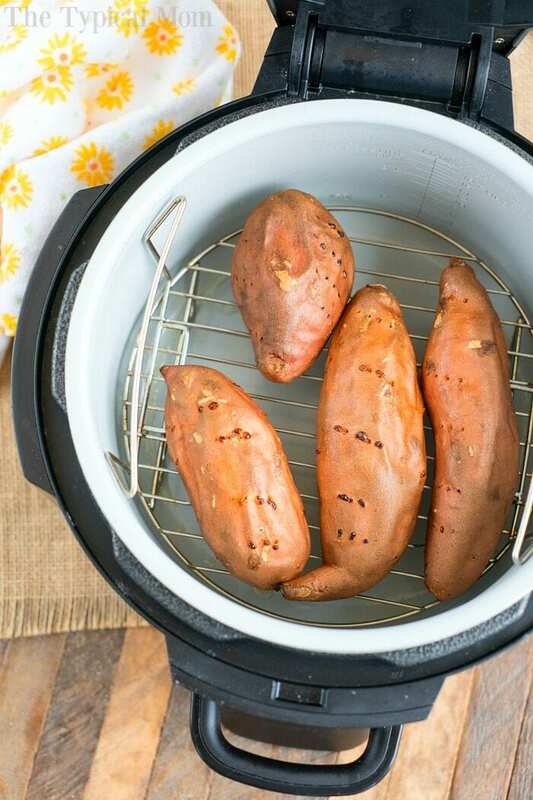 When I tried this sweet potato in the air fryer I was in love. Air frying these babies create a crispy skin on the outside but tender and fluffy on the inside. You just can’t get them like this when you’re baking sweet potatoes in the oven. This is what ours looked like. Honestly we hadn’t really made sweet potatoes in a long time, and never in the air fryer. Before, the best way to make baked potatoes was in the oven. 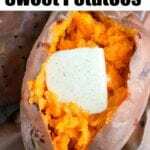 Why we now love sweet potato in the air fryer as well as air fryer baked potatoes. The outside of the potatoes are nice and crispy. They’re a healthy air fryer side dish that just needs some olive oil or cooking spray. If you add salt, the potato skins become amazingly flavorful. Almost better than the inside! The inside of your potatoes come out super tender and fluffy. If you want to make air fryer baked potatoes we have directions for those too. Smoked baked potatoes are similar but making them in your air fryer means a quick cook time. Serve these as a sweet side dish alongside our bacon wrapped air fryer steak and you’ll love them. We will be making sweet potato fries soon and will add instructions soon. We have regular air fryer french fries here and same timing should work. Wash your sweet potatoes. Use a fork to poke all around each one, top and bottom. 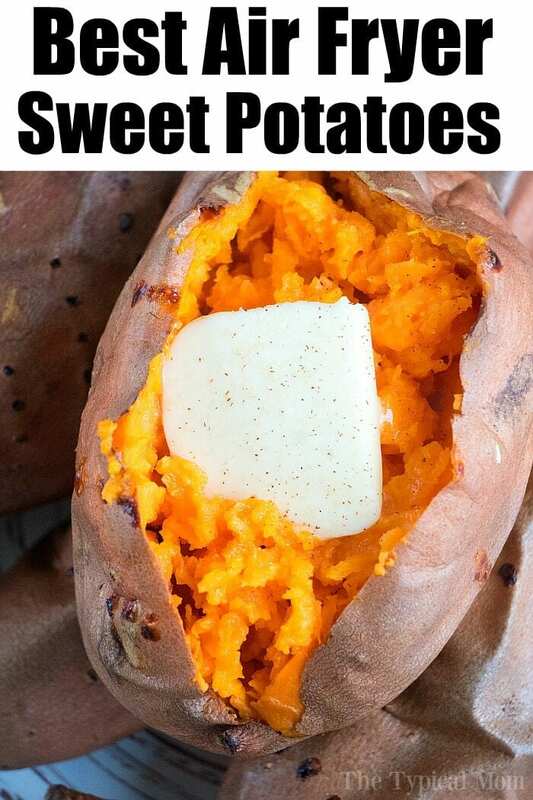 Rub olive oil on the outside of each sweet potato. Using your hands works best. If you want to add salt to the outside to create a salty/sweet taste then sprinkle salt on the outside of each one at this time. Put on the air fryer rack inside your air fryer. If you have the Ninja Foodi turn the metal rack upside down and set your potatoes on top. Remove immediately, slice, fluff the middle and add toppings such as butter and/or mixture of cinnamon and sugar. Can also use this recipe to make homemade sweet potato casserole. Scoop out middle if doing that. Tried this today and it turned out perfect. 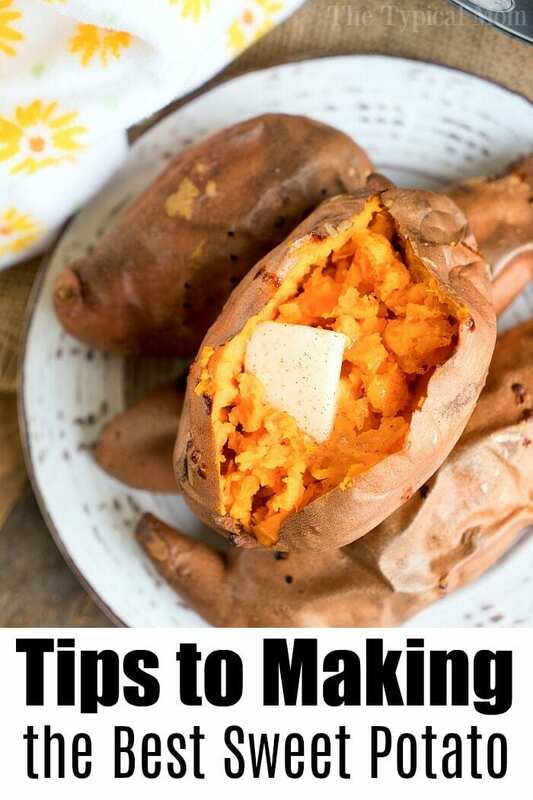 Such a great way to cook sweet potatoes, I will be using this method often. Thank you. So glad you loved them too!